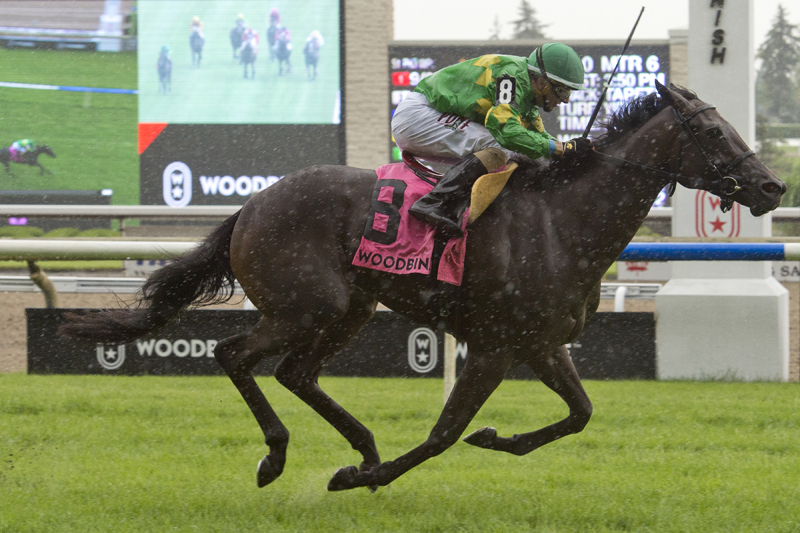 Seeking redemption after a previous stakes disqualification, William Werner’s two-year-old filly My Gal Betty proved to be the best in the inaugural $100,000 Catch a Glimpse Stakes co-featured on Saturday afternoon’s program at Woodbine Racetrack. With the outside post position working to her advantage, My Gal Betty tracked from off the pace as the other fillies battled up front then ran on late to take the lead in the stretch of the six-furlong sprint, opening up more than four lengths over the yielding turf for the victory in 1:11.62. The pace stalkers, Charmaine’s Mia and Bold Script, finished second and third ahead of favourite Eyeinthesky, who had set opening fractions of :23.33 and :46.78. “We got a good post position and we just played it by ear to see who was going to be the speed and we just sat off behind and just made one run,” said winning jockey Rafael Hernandez. My Gal Betty had crossed the wire first in both of her previous starts but was placed third in the My Dear Stakes last time out on July 7 when judges ruled she had caused interference in the stretch to another filly. Sent postward as the 5-2 second choice, My Gal Betty paid $7, $4.10 and $2.80. She combined with 39-1 longshot Charmaine’s Mia ($26.50, $9.30) for an 8-7 exacta worth $161.50. With Bold Script ($4.10) third, the 8-7-1 trifecta paid $328.45 and the superfecta of 8-7-1-2 completed by favourite Eyeinthesky returned $1,002.40, both for $1 tickets. Si Si Tequila, the promoted My Dear Stakes winner Stifling and Lady Azalea, also trained by Attfield, completed the order of finish. Limonaia was scratched. A new local turf prep in advance of next month’s Grade 1 Natalma, the Catch a Glimpse is named for Canada’s 2015 Horse of the Year, who won that race at Woodbine before capturing the Breeders’ Cup Juvenile Fillies Turf and five other graded turf stakes. Mark Casse trained the City Zip filly for owners Gary Barber, Michael James Ambler and Windways Farm.